Axinite-(Mn): Mineral information, data and localities. The iron-rich mineral was named axinite in 1797 by Rene Just Haüy from the Greek αξίνα ("axina") for "axe", in allusion to the common habit of its crystals. Manganese-dominant axinite chemical analyses were reported by Frederick A. Genth in 1891, who noted that Franklin, New Jersey axinite had the highest known manganese contents. Robert Mauzelius also found manganese-dominant axinite in 1895. Manganaxinite was named by Waldemar T. Schaller in 1909 and mangaxinit was used by J. Fromme in 1909, both mentioning Franklin, New Jersey. Manganoaxinite was used by Schaller in 1911, but Schaller did not provide a species description as his research material was "destroyed by fire." Manganaxinite was used by Gregori Aminoff in 1919 when referring to specimens from Franklin, New Jersey, USA and a complete species description was finally made by Charles Palache in 1929 and was expanded by Palache (1935), both based on Franklin, New Jersey specimens. Renamed with suffix "-(Mn)" by IMA in 2007. Axinite Group. Axinite-(Fe)-Axinite-(Mn) Series, and the Axinite-(Mn)-Tinzenite Series. The Mn2+ analogue of Axinite-(Fe) and Axinite-(Mg). 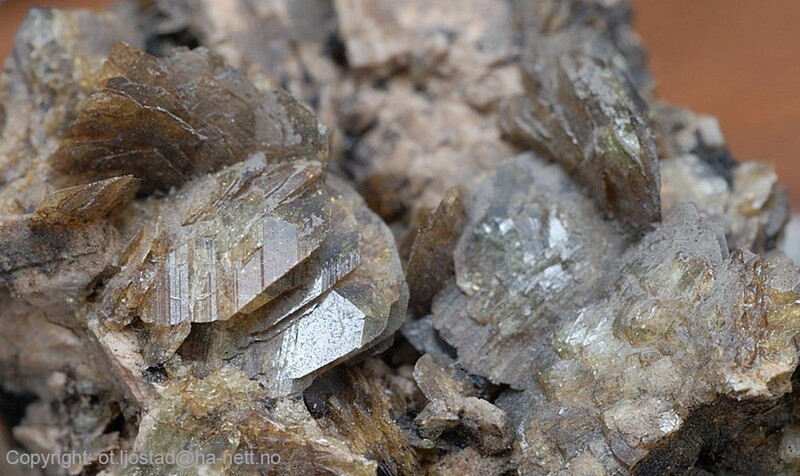 Visit gemdat.org for gemological information about Axinite-(Mn). 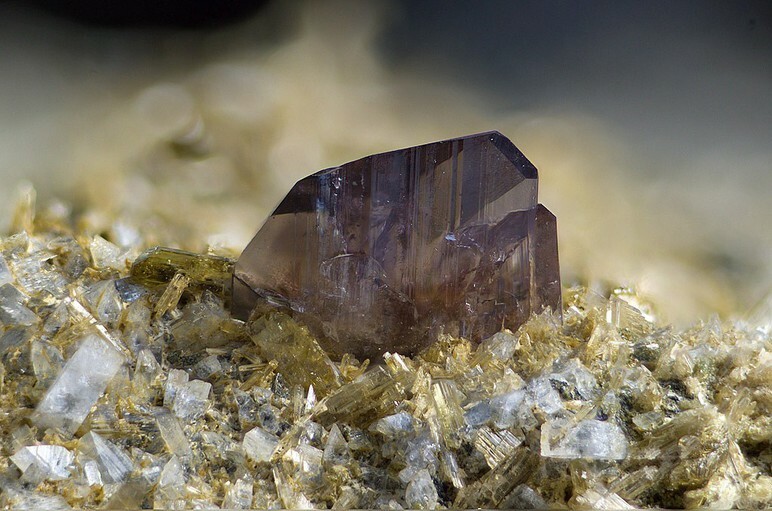 Renamed by the CNMNC IMA in 2007 from manganaxinite to Axinite-(Mn) (IMA 07-C). Willemite 37 photos of Axinite-(Mn) associated with Willemite on mindat.org. Andradite 26 photos of Axinite-(Mn) associated with Andradite on mindat.org. Rhodonite 25 photos of Axinite-(Mn) associated with Rhodonite on mindat.org. Hancockite 18 photos of Axinite-(Mn) associated with Hancockite on mindat.org. Hendricksite 17 photos of Axinite-(Mn) associated with Hendricksite on mindat.org. Clinohedrite 15 photos of Axinite-(Mn) associated with Clinohedrite on mindat.org. Johannsenite 13 photos of Axinite-(Mn) associated with Johannsenite on mindat.org. Margarosanite 13 photos of Axinite-(Mn) associated with Margarosanite on mindat.org. Cahnite 12 photos of Axinite-(Mn) associated with Cahnite on mindat.org. Calcite 8 photos of Axinite-(Mn) associated with Calcite on mindat.org. Magenta-red (SW UV) (Franklin, NJ massive material only). Genth, Frederick A., Penfield, Samuel L., and Pirsson, Louis V. (1891) Contibutions to Mineralogy, No. 50, with Crystallographic Notes, American Jpournal of Science, series three, v. 41, p. 394-400. Cleve,Per Theodor (1895) Geologisk Fohrenstock Forhandlingar, v. 17, p. 279. Sjögren, H. (1895) Preliminära meddelanden om några undersökningar på svenska mineral: Axinite analyses by Mauzelius of varieties from Nordmark and Daunetnora and discussion of composition. Geologiska Föreningen i Stockholm Förhandlingar: 17: 279. Fromme, J. (1909) Chemisch-mineralogische notizen aus dem Radautale. Tschermaks Mineralogische und Petrographische Mitteilungen 28, 305-328. Aminoff, Gustav (1919) [Mineralogical Studies on Material from Sjögren's Mineral Collection]. Arkiv. Kemi. Min. Geol. : 7 (17): 1-58. Palache, Charles (1929) Paragenetic Classification of the Minerals of Franklin, New Jersey. American Mineralogist: 14: 1-18. Grew, Edward S., and Anovitz, L. M. (1996) BORON: Mineralogy, Petrology and Geochemistry, second edition, as revised (2002). Zagorsky, V. Ye., Peretyazhko, I. S., Dmitrieva, A. S. (2016): Axinite-(Mn) from miarolitic granitic pegmatites of the Malkhan gem-tourmaline deposit (Transbaikalia, Russia): composition, paragenesis and formation conditions. European Journal of Mineralogy, 28, 811-824. Henry, D.A., Birch, W.D. & MacRae, C.M. (2005): Manganaxinite from Pyle's limestone near Benambra, and ferroaxinite from Corop, Victoria. Australian Journal of Mineralogy 11, 27-33. Ilkka Mikkola data. Identified with XRD and microprobe (WDS). Gautron, L. and Meisser, N. (2001). Prehnite from La Combe de la Selle, Saint Christophe en Oisans - Isère - France. 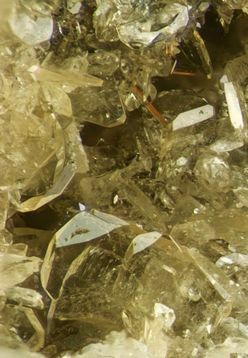 Mineralogical Record, 32 (3), 223-232. Gaine, R., Skinner, C., Foord, E., Mason, B., Rosenzweig, A., and King, V., , 1997, The System of Mineralogy, eighth edition. Tanca, G.A., Gamboni, A., Mamberti, M. & Mascia, S. (2007) – Furru e Conca, Massiccio granitico del Monte Limbara, Calangianus, Olbia-Tempio Pausania - Rivista Mineralogica Italiana, Milano. 31,4,pp.274-281. - Orlandi, P. (2011): Zibaldone di mineralogia italiana 2010: parte seconda. Micro, 3/2011, 98-100. - Dini, A., Orlandi, P. & Vezzoni, S. (2013). Temperino e Lanzi. Le paragenesi primarie dello skarn. Rivista Mineralogica Italiana, 1/2013, 28-39. Momoi, H. (1964) Mem. Fac. Sci., Kyushu University, Series D, Geology, 15, #1, 73-78. Joe Cilen collection #11,432 (originally from Ralph Merrill/Minerals Unlimited, 1950s, labelled just "axinite"). Ohe Rikosha specimens, Kyoto; Alfredo Petrov collection. Fluorite: The Collector's Choice. Extra Lapis English No. 9; Gaines, Skinner, Foord, Mason, Rosenzweig, and King, 1997, Dana's New Mineralogy. Pringle, I.J., Kawachi, Y. (1980) Axinite mineral group in low-grade regionally metamorphosed rocks in southern New Zealand. American Mineralogist, 65: 1119-1129. Mineralogical Record 28, no. 4 (1997); Hyrsl, J. (2013): Neue Funde von Axinit-(Fe) und Epidot nahe Sayan in Zentral-Peru. Mineralien-Welt, 24(6), 141-144. Brusnitzin, A. I.; Semkova, T. A.; Chukanov, N. V. (1997): Manganaxinite from the Kyzil-Tash deposit as a new occurrence in the southern Urals. Vestnik Sankt-Peterburgskogo Universiteta, Seriya 7: Geologiya, Geografiya 1997 (2), 89-94 (in Russian). Zagorsky, V. Ye., Peretyazhko, I.S., Dmitrieva, A.S. (2016): Axinite-(Mn) from miarolitic granitic pegmatites of the Malkhan gem-tourmaline deposit (Transbaikalia, Russia): composition, paragenesis and formation conditions. European Journal of Mineralogy, 28, 811-824. Anthony, J.W., et al (1995), Mineralogy of Arizona, 3rd.ed. : 288; Reiter, B.E. (1981), Controls on lead-zinc skarn mineralization, Iron Cap mine area, Aravaipa district, Graham Co., AZ, in C. Stone and J.P. Jenney (editors), AZ Geol. Soc. Digest: 13: 117-125.; Grant, Raymond W., Bideaux, R.A., and Williams, S.A. (2006) Minerals Added to the Arizona List 1995-2005: 4. Anthony, J.W., et al (1995), Mineralogy of Arizona, 3rd.ed. : 179, 288; Bideaux, R.A., et al (1960), Some new occurrences of minerals of Arizona, AZ Geol. Soc. Digest: 3: 53-56. Anthony, J.W., et al (1995), Mineralogy of Arizona, 3rd.ed. : 328; Bideaux, R.A., et al (1960), Some new occurrences of minerals of AZ, AZ Geol. Soc. Digest: 3: 53-56. Schaller, Waldemar Theodore (1911b), Axinite from California: USGS Bulletin 490: 42; Tucker, W. Burling & C.A. Waring (1919), El Dorado County: California Mining Bureau. Report 15: 276-278; Murdoch, Joseph & Robert W. Webb (1966), Minerals of California, Centennial Volume (1866-1966): California Division Mines & Geology Bulletin 189: 65, 91, 175. Aminoff, G., 1919, Mineralogical Studies on Material from Sjogren's Mineral Collection, Archiv. Kemi. Min. Geol. v 7, (17), p. 1-58. Palache(1935):16 & 100; Dunn(1995):Pt1:133 & Pt3:417. Gaine, R., Skinner, C., Foord, E., Mason, B., Rosenzweig, A., and King, V., , 1997, The System of Mineralogy, eighth edition. Montgomery, A., 1969, The Mineralogy of Pennsylvania 1922-1965, Special Pub. no. 9, The Academy of Natural Sciences of Philadelphia. Smith, R., 1978, The Mineralogy of Pennsylvania 1966-1975, Friends of Mineralogy Penn. Chap.